Rehabilitation must play a greater role in halting the rising tide of long-term illness and incapacity in the workforce, the Institute of Directors (IoD) said. With about 700,000 new claimants of Incapacity Benefit each year, government and employers must work together to help long-term absentees back into work, the IoD said. More than 2.7 million people of working age now claim some form of incapacity benefit, so the time for action is long overdue, siad Geraint Day, head of health policy at the IoD. “The chances of returning to regular employment tend to diminish with the length of absence from work,” he said. There has been no underlying health change to the UK’s population to account for the growing number of long-term sick and injured. “The causes are many and varied, yet the fact is that the numbers add up to great losses: to individuals, to employers and to the nation,” Day said. A survey of IoD members showed that employers are aware of the importance of health issues in the workplace. Half of respondents said that their companies provided an occupational health service for employees. However, employers felt that more could be done by other bodies to assist in rehabilitating staff on long-term sick leave. 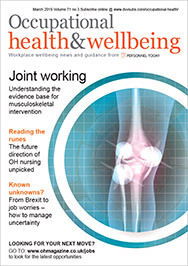 “As things stand the lack of an effective NHS rehabilitation service means that the onus is currently on employers and individuals to deal with the issue of rehabilitation,” Day said.